MOUNTAIN VIEW, Calif.--(BUSINESS WIRE)--Knightscope, developer of advanced physical security technologies focused on significantly enhancing US security operations, and Securitas AB (SECU-B.ST), the world’s second largest private security company, announced today that the parties are extending their channel partner agreement through February 2020. The agreement gives Securitas Security Services USA, Inc., a subsidiary of Securitas, rights to offer Knightscope’s technologies to its significant existing customer base, while Knightscope continues to develop new technologies and provide operational support. Knightscope and Securitas have been working together over the past year and have successfully deployed Knightscope’s security robots at several key Securitas accounts in California. Investors interested in purchasing Series m Preferred Stock in Knightscope can now do so exclusively online at SeedInvest: www.seedinvest.com/knightscope. Knightscope, Inc. is an advanced security technology company that utilizes Software + Hardware + Humans to provide its clients with new groundbreaking anomaly detection capabilities. In an increasingly volatile world, we are developing one of the most important technologies to come out of Silicon Valley that will empower the public and private sectors to proactively build stronger, safer communities, ultimately saving money and lives. Crime has a $1 trillion negative economic impact on the U.S. every single year and our long-term mission is to cut it in half. 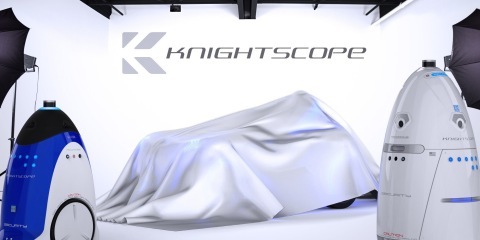 Schedule a demo and learn more at www.knightscope.com. Securitas is a global knowledge leader in security. We base our security solutions on customer-specific needs through different combinations of on-site, mobile and remote guarding, electronic security, fire and safety and corporate risk management. Everywhere from small stores to airports, our 330,000 employees are making a difference. An offering statement regarding this offering has been filed with the SEC. The SEC has qualified that offering statement which only means that Knightscope may make sales of the securities described by that offering statement. It does not mean that the SEC has approved, passed upon the merits or passed upon the accuracy or completeness of the information in the offering statement. You may obtain a copy of the offering circular that is part of that offering statement here. You should read the offering circular before making any investment. Knightscope extends agreement three years with second largest private security company, Securitas. Strategic Move to Drive Nationwide Growth of Autonomous Security Robots.